Just the other day I was about to whip up a batch of cookies when it hit me. I have seen tons of recipes using bazaar ingredients to recreate brownies and cookies. I am not really a fan of taking something beloved like that and trying to make it into something healthy. It never tastes the same and doesn't satisfy your cravings. Instead of taking something decadent and making healthy, I decided to take super healthy ingredients and turn them into a decadent treat! See the difference? What I came up with is a winner, kids. For reals. I am eating the last bit by the spoonful as I type this. 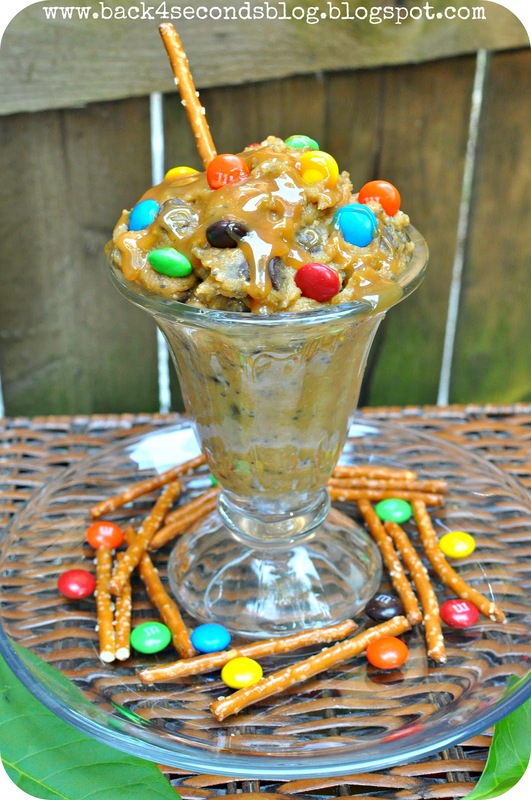 Now when those cookie dough cravings hit you don't have to feel guilty! Grab some pretzels (or a spoon) and dig in! In a food processor blend chickpeas, oats, peanut butter, brown sugar, baking soda, and vanilla until smooth. If you want to add a major health punch add the chia seeds. They give a slightly nutty flavor and a seedy texture, so if you want this to be more like traditional cookie dough omit the seeds. I personally loved the addition of chia seeds though ;) Stir in chocolate chips and, voila! Cookie dough! Giiiiirl, this is rockin'. Cookie dough dip that's healthy?! I'm ALL over it. Especially using up that can of chickpeas in my pantry--awesome invention!! You had me at the title. Just had to check it out. Not going to lie, I've never bought a chickpea but I think it's time. Thanks for the recipe. What a genius idea! It looks so much like the real thing. I would love for you to share this with my readers at Mealtime Monday! You almost had me fooled! So fun! Thanks for bringing this great imposter to ON THE MENU MONDAY! it sounds so good! i just have one question: why do you add baking soda if you don't bake it? Oh yes, I've made this several times! Love it! I got it from Chocolate Covered Katie's blog...she has tons of healthy dessert recipes and several using chickpeas. oh my gosh! this looks and sounds amazing! can't wait to try it!! I am seriously going to have to try this!! So glad you found me so that I could follow you back! YAY! 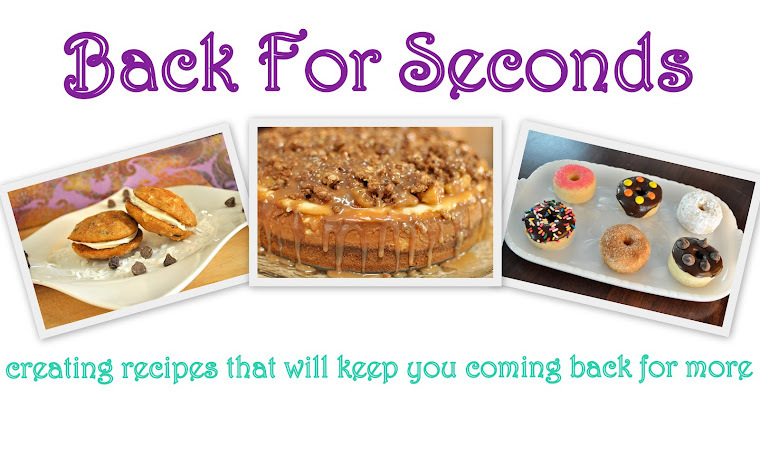 I am looking forward to sharing some great recipes! My six year old is sitting next to me and insisting that we try this. It looks amazing! Saw this on one of the linky party blogs and glad I did. This looks like a delicious treat to try! I am loving chickpeas lately, but haven't tried them in desserts yet. This is definitely the place to start! Looks yummy! Thanks for sharing at the Pomp Party! Pinning to our Pomp Party board! interesting! i'll have to give this a try! thanks for sharing! Wow, chickpeas, really? I can't wait to try this. I'll make it when the kids are out then just watch as the gobble it up, just like sneaking fruits and veggies into other treats, hehe. Thanks for sharing! WOW, that sound amazing. I am soaking chickpeas tonight for making Hummus. Now half will go to this recipe. YUM! Every time I make chocolate chip cookies, it's a fight to end up with enough dough for the cookies by the time my husband and son get to the dough. I may or may not have had a pinch or two myself. Chickpeas? I would NEVER have come up with that! Yum! Love how healthy it is and looks sooooooooooooo delicious! I totally love recipes like this! Your photo is great too. Thanks a million for linking up at Weekend Potluck. Hi! Visiting through the Sew Can Do link party. This looks fantastic!!! I cannot wait to try it! Thank you for sharing. I need to try this! Looks so yummy! Visiting from Serendipity and Spice. I never imagined chickpeas in a dough recipe. Thanks for sharing. I think I'm in love! 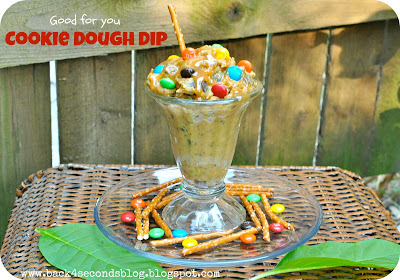 I love cookie dough, and I can't wait to try this. I would love for you to link this to my Sunday Slice party. I can't wait to try it! Featuring your post on "A Little Birdie Told Me..." this week. I added this to my to-do list. I have to try it. Thanks for sharing. Psst, I've already told you how awesome this sounds, now I'm just popping back to let you know I'm featuring this on Thursday's treasures tomorrow. Have a great day! Wow! This looks like it should be the most sinful dessert in the world, but it's actually healthy! 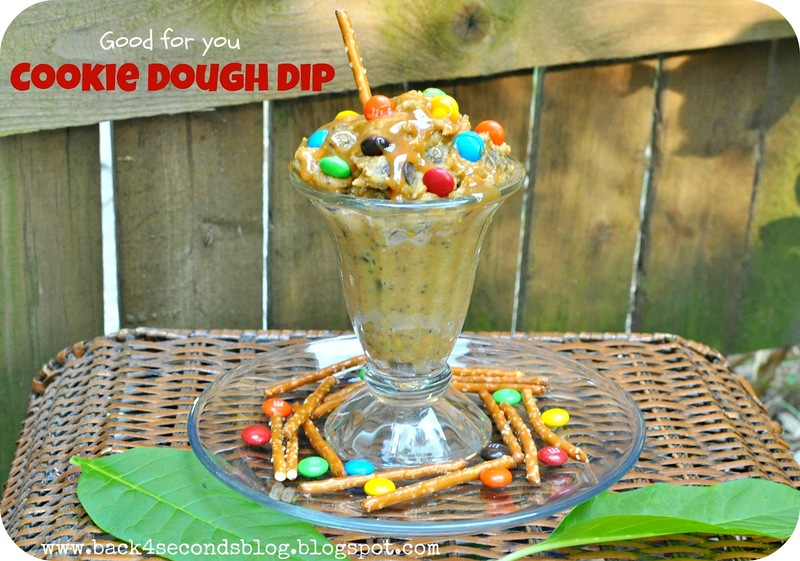 Thank you for sharing this recipe with us at our Summer BBQ Bash! Very excited to find this recipe! I'm a new follower from Social Sunday! Hope you can stop in!